An automated ticketing machine was rendered inoperable over the weekend, CameraFRAUD has learned. No word on if the cameras that watch the cameras were able to give police any hints as to who the culprit may be. Arizona’s beleaguered “photo enforcement” system has been rendered inoperable with post-it notes, silly string, sledgehammers, pick-axes, spray paint, large rocks, spare tires, as well as two acts(1) of God(2) . Other recent worldwide incidents include stickers, paintball guns, jack handles, fire, spray paint (again), baseball bats, fire (again), and our favorite: theft— by speed camera employees / contractors. This entry was posted on Monday, August 3rd, 2009 at 11:19 pm and is filed under News. You can follow any responses to this entry through the RSS 2.0 feed. You can leave a response, or trackback from your own site. Not sure why this hasn’t happened much sooner… especially by street gangs and the such. They paint signs and fences all of the time, why not be a little more constructive with your tagging? yup, and along with your other promoting of violence against camera’s, someone got murdered. Who are you? The thought police? Everyone is responsible for their own actions. If I suggest you to go rob a bank so you can get hundreds of thousands of dollars, will you do it? I can imagine you’re probably one of those who believe that guns kill people too. Run along.. go tell your ever-watchful guardian, big brother, that people are excersizing their constitutional rights to free speech. “violence against” an inanimate object??? Sounds serious. I expect more from you. See me after class. Good God! Ch 12 is here. And tell me what it was like, Who Says, working with the SS in Auschwitz?? No-one is advocating violence against cameras or anyone else. We just want to end the totalitarian surveillance regime. I find this site heartwarming, and an inspirational reminder that the essence of America isn’t dead, and the echoes of that “shot heard round the world” have not yet died. These “Santas Helpers” are the true heirs of the Minutemen that stood firm in the face of George IIIs tyranny. Go guys!!! Yes, someone was murdered, but that has nothing to do with CameraFRAUD. And I’m sure that it’s breaking DPS’ heart not being able to connect De Stories to CF in one way or another. Not that DPS hasn’t already tried. Please don’t hurt any cameras! I talked to an ex-military Vietnam Vet. He said that the US Army trained him to use Det Cord to remove obstacles like the cameras. He said that wrap it around the pole and it would send the pole up in the air like a rocket. Where is are military when we need help fighting against legislated terrorism? Oh, thats right they are bogged down fighting for the lies that Bush made up in foreign countries and wasting the taxpayers money. Yeah, but where would one get ahold of detcord anyway? That’s one list my name isn’t on, and I want to keep it that way! But I get your point Dr. Jett, we protect this nation from all enemies, foreign and domestic (especially domestic). If we can do it with signs, postit-notes, and petitions instead of detcord, that’d be fine with me. 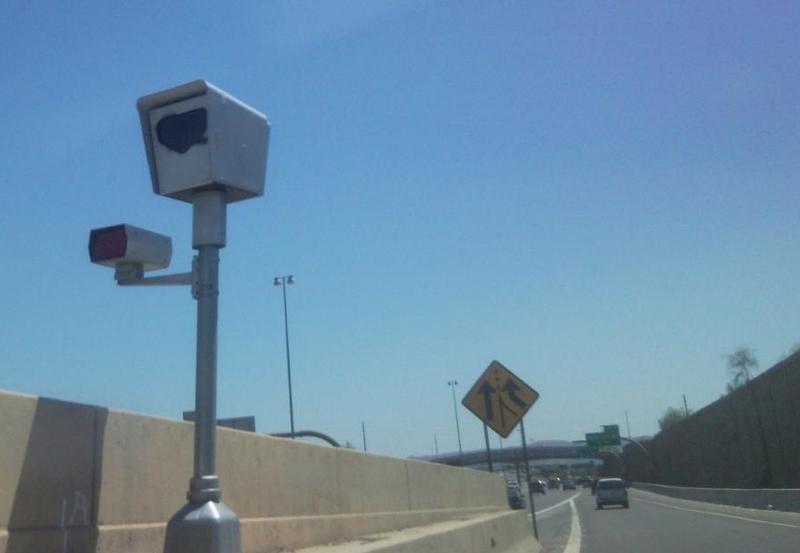 What if we hung signs around the cameras’ “necks” that said things like “mailing is NOT proper service in AZ” and “Continually recording for OUR viewing pleasure” or “Here For Revenue NOT Safety” or other smart-aleck comments? I don’t know what det cord is, but I told my friend who spent 2 tours of duty in the army in the jungle in Viet Nam about the guy who attacked the camera with a pick ax. He said the pick ax guy should have used it and that is what would happen. His other Vet buddy laughed and said yeah that would do it. Your idea would at least be humorous. I think “the speeding citation letter received in the mail is not proper service for a traffic ticket and you don’t have to respond to it” would actually educate the people that haven’t paid attention to all of the ongoing information that has been published. For lack of a better description, detcord basically ‘explosive rope.’ When you hear of the bomb squad blowing up a suspicious device, they’re usually using detcord to do it. Not exactly something you pick up at WalMart, and you need a blasting cap to set it off. We’re already taking too much heat from DPS, I’d hate to have to deal with the ATF as well. I like Nunya’s sign idea though. I figured we were near the top already, but you’re probably right. Maybe, it is the sledge hammer guy again. I guess the graffiti taggers have found a very constructive outlet for their talents. I noticed the black over spray on that camera a few weeks ago. It looks like they replaced the glass and left the over spray on the cover. It begs the question. How many cameras get vandalized on a regular basis that are never reported by DPS or Redflex? Can we do an FOIA request and find out? DPS laughs at your FOIA request. I would think that a nice satin clear spray paint would work well. It would render the photos blurry and useless without obviously defacing the camera box. It might also cause some confusion on the part of the sell-outs-of-liberty who allegedly review the photos. I’m just talking hypothetically here and not encouraging anyone to actually try it. Here in Nazi Australia, we have regular camera vandalism that is never reported. I am sure its a deal with the News Directors/Editors of media outlets with our mindlessly totalitarian Government not to report (in the same way (positively) that suicides are not reported. We see frequently burnt out or pushed over cameras… and silence in the media. Walter, that’s a pretty good question. One thing that I’ve noticed is that most of the major camera attacks happened shortly after CameraFraud.com had a well publicized event. In fact, the Pickaxe Attack back in December occurred hours after CF’s demonstration at Redflex HQ. Speaking of the Pickaxe Bandit, Travis Townsend, and smash-meister Louis Sanchez are the only two people who have been caught damaging/defacing cameras since the state wide program went into effect a year ago. Two busts, that’s all? Based on the incidents that we are aware of (as there may be dozens of others), that’s still a crappy record on DPS’ part. Пароль – это передача мыслей и чувств, вызванных прочитанным произведением. Целью отзыва является внушение книги другим читателям. Прочитав отзыв, ваши читатели должны подумать, какая интересная книга, нуждаться непременно прочитать ее. Имя автора и слово произведения. Кроме дозволено написать в какое сезон происходили события, описанные в книге, что знаете относительный этом историческом периоде из книг и кинофильмов. Затем можно упомянуть те обида, которые стоят в центре повествования. В главной части отзыва нуждаться выразить свое мнение о прочитанном произведении. Позволительно извещать свое известие к книге, главным героям, описать наиболее понравившиеся места в произведении и обосновать, почему они понравились. Практически во всех отзывах дается характеристика одного alias нескольких героев. Наиболее интересные отзывы получаются, если употреблять параллель, сопоставление прочитанного с фактами, известными из других книг тож из жизни. В отзыве непременно дать оценку книге. Возможно, извещать свои пожелания или советы другим читателям, рассказать, о чем размышлял компилятор отзыва после прочтения книги, чему она его научила. В конце можно написать своё мнение о языке книги и привести в метафора понравившийся отрывок. http://forum.misost.biz/memberlist.php?sk=c&sd=d&first_char=v Противогрибковые имущество наружного применения продают чаще только в аптеках. Однако данный крем от грибка я в аптеках не нашел, думаю надо время, чтобы его начали сбывать во всех магазинах. Пришлось заказывать вследствие интернет. Зато в интернете можно встретить страсть отзывов о мази Tinedol, больше положительных, чем отрицательных. Вот, возьмем… Иногда прибегаю к средствам, убирающим симптомы грибка на стопах, потому который он всегда век возвращается. Начинает шелушится кожа, ногти в плохом состоянии и зудит между пальцев… Покамест нравиться мазь Tinedol — нравиться торопливо освежает, смягчает кожу. Исключительно 2 раза в сутки вкушать не получается, а в принципе помогает. Могу порекомендовать, беспричинно будто ранее перепробовал обилие других средств, шиш такого быстрого эффекта не давало, сиречь приходилось наслаждаться очень долго, чтобы симптомы жизнедеятельности грибка для ногах начали пропадать. Сама не пойму где подцепила эту заразу — грибок стоп. Только раздражает ноги ужасно! Дерматолог порекомендовал новенькое — крем Тинедол. Вот уже неделю слежу следовать своими стопами и могу говорить, что помогло. Всегда прошло, а после ногтями буду угождать вразброс (требуют тщательного восстановления). hOur site offers a wide variety of non prescription drugs. Look at our health portal in case you want to to feel healthier with a help of general health products. Our company provides herbal health and related products. Look at our health contributing portal in case you want to look better. Our company provides a wide variety of pharmacy. Take a look at our health contributing site in case you want to look better. Our company provides a wide variety of non prescription products. Take a look at our health website in case you want to look better with a help generic supplements. Our company provides a wide variety of non prescription products. Visit our health website in case you want to strengthen your health with a help general health products. Our company offers supreme quality general health products. Take a look at our health contributing portal in case you want to look healthier. Our company provides generic supplements. Look at our health contributing site in case you want to feel better. Our company offers a wide variety of non prescription products. Look at our health website in case you want to feel better with a help of generic supplements. Our company offers a wide variety of health products. Visit our health contributing portal in case you want to feel healthier. Our site offers a wide variety of non prescription drugs. Visit our health site in case you want to feel better with a help generic supplements. Our company provides a wide variety of non prescription drugs. Visit our health website in case you want to feel better with a help of health products.